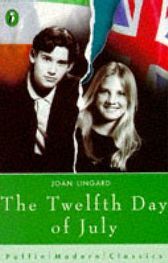 The Twelfth Day Of July was the first in a series of books which became known as the ‘Kevin and Sadie’ stories, as each one followed the lives of Kevin and Sadie as they grew up in Northern Ireland and became adults with children of their own. The quintet set of books are each a riveting read, realistically telling of the difficulties between Protestants and Catholics in Belfast, at a time where soldiers walk the streets and shootings and bombings are a regular occurrence. I first read this book years ago when aged around 12. It is one of those books that makes such an impression on you that you never forget it and when I came across it again recently whilst having a clear out, I found myself reading it again, wondering how I would feel reading it again years later as an adult. I was surprised to find I enjoyed it just as much as I did when I was 12 and having looked it up online, I discovered I am not the only adult who has returned to read this book. The general opinion seems to be it is a book which although written for young adults, can also be enjoyed equally by older adults. This first book introduces us to Kevin McCoy and Sadie Jackson whose lives collide on the streets of Belfast. They are both children, both living with their families in similar houses on similar streets. Only one thing divides them : Kevin is Catholic, Sadie is Protestant. After Sadie catches Kevin and his friends defacing a mural of King Billy (William of Orange) she swears revenge and there begins a feud between the two. A very angry Sadie vows that Kevin will not get away with what he has done. Sadie is a very fiery character and the amount of times she wants to hit someone over the head is quite alarming. What sets this apart from usual childhood arguments and fights is that it comes across as much more serious. Sadie and her friends are getting ready for the 12th of July and the Orangemen’s parade and are busy making decorations and trying to raise money to celebrate King Billy on ‘the glorious 12th’, but keep having run-ins with Kevin and his friends, which eventually results in quite a bloody riot where Kevin’s sister, Brede, is badly hurt and taken to hospital. Brede is a quiet, sensible girl who has not taken part in any of the fighting and it is Brede getting hurt that brings Kevin and Sadie to their senses, drawing them together. However, because of their religions, their families and others do not approve of their friendship and this is the start of more troubles ahead for Kevin and Sadie, which are explored in the subsequent books which sees them become a couple, outcast by family and fleeing Belfast to start a new life together, eventually having children of their own. Their struggles continue as the pair try to make a life together. I recall reading this book and indeed the subsequent ones, when I was young and having my eyes opened at the troubles in Northern Ireland. Although I was aware of them to some extent, as troubles in Northern Ireland regularly made headline news back then, reading this book gave me a much greater insight into the way Catholics and Protestants lived divided lives in Belfast. Joan Lingard pulls no punches and manages to portray brilliantly the struggles of both sides growing up in such a tense and bitter atmosphere. Joan herself, although born in Scotland, grew up in Northern Ireland, so was able to write from experience which accounts for the realism of these books. Even though she wrote this book in the 70’s it still is a book that can be enjoyed just as much today and still manages to bring home to you how difficult things were. Children still managed to have happy childhoods despite the violence and feuding which was always there in the background, as Catholics and Protestants had it instilled into them from a young age that they were not to mix. I remember being shocked at the time of reading this, thinking of my own friends, a mixture of both Catholics and Protestants and couldn’t for the life of me imagine being in that situation. It was a real eye-opener. Joan’s candid writing here set this book apart from many other young adult books in the 70’s and possibly explains why it became so popular, with adults like myself never forgetting reading it and also revisiting it to read again as an adult. Indeed all the Kevin and Sadie books have never been out of print since they were written! Despite the troubles, Joan also manages to inject some humour into the book to show that families still had happy times also and were capable of enjoying themselves. Reading this again recently I found more humour in it than I did when I was young and some of the language is maybe a little dated, but its impact on me remains as strong as ever. This series of books grows with the reader as they follow Kevin and Sadie into adulthood and you are willing them to find contentment and happiness together in often very difficult circumstances. Joan Lingard manages to show here that although divided by religion, people are all the same underneath, with the same emotions and needs. The book does not take sides on the issues but shows how futile religious conflict can be. It has been for me, an unforgettable story. No Comments on "The Twelfth Day Of July"